THE STORY: Simon Schama, the acclaimed Columbia University professor, may be best known as the voice of dozens of BBC, PBS, and History Channel documentaries. That includes the monumental five-part “The Story of the Jews,” a sweeping, 3,000-year history, which Schama wrote and narrated for BBC and PBS in 2013. 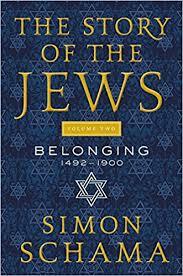 Schama’s latest book is The Story of the Jews, Volume Two: Belonging: 1492-1900 (Harper Collins, 800 pp. ), which came out in October. It is the second of what will be three volumes that cover the same territory as Schama did in the documentary. The book is “an engaging and electrifying read by a skilled literary craftsman, cultural historian and tour guide,” the novelist and essayist Thane Rosenbaum wrote in his Washington Post review. The Story takes us to “such far-flung places,” Rosenbaum wrote, such as Venice, London, Paris, Istanbul, Jerusalem, and San Francisco. This largely unsung group includes David Ha-Reuveni, a 16th century European traveler and mystic; the 18th-century British boxer Daniel Mendoza; the mid-16th century Italian showman Leone de’Sommi; the mid-17th century Chinese general Chao Ch’eng; the pioneering mid-18th century French physician Jacob Rodrigues Pereire; and the mid-19th century American actress, painter, and poet Adah Isaac Menken. Plus—I am happy to say—Schama tells the story of the one and only Uriah Phillips Levy in the book. He recounts what I wrote about in Saving Monticello: UPL’s stewardship of Monticello and includes the story of the statue of Thomas Jefferson that Levy commissioned in 1833, which now is in Statuary Hall in the U.S. Capitol’s Rotunda. AMERICAN HERITAGE: When I started doing the research for the 1997 Preservation magazine article on the Levys and Monticello (which would become the progenitor of Saving Monticello), I discovered an article on that exact subject by Annabelle Prager in the February/March 1978 issue of American Heritage magazine. The article proved to be well researched and accurate, although the writing was a tad too flowery in places and the tone a bit too hagiographic. 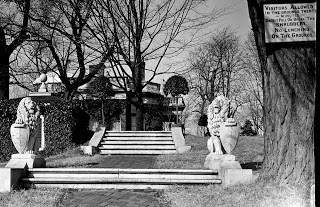 It was also too vague on the misrepresentations made by Maude Littleton in her 1909-1914 campaign to take Monticello from Jefferson Levy. Nevertheless, overall Ms. Prager did a fine job telling the Levys’ Monticello story. To wit: “Visitors to Monticello today, taking in its handsome lawns,” she wrote, may not know that “Monticello was saved from ignominious ruin because it had the good fortune to fall into the hands of men who believed that its builder, Thomas Jefferson, was the greatest of all Americans. · Monday, December 4 – 4:00 p.m. Eastern appearance on the Mike Slater Show, AM 760, San Diego on Lafayette: Idealist General. GIFT IDEAS: Want a personally autographed, brand-new paperback copy of Saving Monticello? Please e-mail me at Marc527psc@aol.com I also have a few as-new, unopened hardcover copies. Or go to marcleepson.com/signedbooks.html to order copies through my local bookstore, Second Chapter Books in Middleburg, Virginia. We also have copies of Desperate Engagement, Flag, Lafayette, and What So Proudly We Hailed, and Ballad of the Green Beret.